Although parts of Iowa have had adequate moisture, other areas could use some rain. If your area is hot and dry, scout fields now for grasshoppers and spider mites. Although some parts of Iowa have had adequate moisture, other areas could use some rain. Drought stress combined with high temperatures is good news for field crop pests like grasshoppers and spider mites. They thrive in hot, dry weather, says Erin Hodgson, Iowa State University Extension entomologist. If your area is hot and dry, consider scouting fields now for these insect pests, and continue scouting once a week throughout August. Hodgson offers the following information and recommendations for scouting and treatment if needed. * The two-spotted spider mite thrives in hot, dry weather. Infestations typically start at field margins and progressively move to the center, if weather conditions remain favorable. Use a hand lens or shake plants on paper to see if mites are present. Spider mite injury to soybeans can resemble herbicide injury or a foliar disease; however, characteristic signs are tiny yellow spots, or stipples, on leaves. As the injury becomes more severe, leaves turn yellow, then brown, and finally die and drop off. Spider mite injury can reduce soybean yields by 40% to 60% and cause pod shattering, wrinkled seed and early maturity. In corn, prolonged spider mite feeding will turn leaves yellow with stippling on the upper surface. Heavy infestations can cause premature drying, which results in the loss of leaf tissue, stalk breakage, and kernel shrinkage. Under dry conditions, foliar treatments are recommended when plants have substantial stippling or leaf-yellowing and spider mites are active. 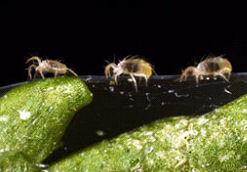 Although spider mites are not insects, they are often treated with insecticides. Pyrethroid chemicals are not very effective at reducing outbreaks, so consider using organophosphates. Using pyrethroids to control other pests (e.g., soybean aphid) may actually flare spider mites in the field. * Grasshoppers are also favored by warm and dry weather, which encourages their growth and development. When late summer grasshopper damage occurs, it usually is related to drought conditions and is frequently, but not always, restricted to field edges. There are two common grasshoppers in soybeans in Iowa, the differential grasshopper and the redlegged grasshopper. Young grasshopper nymphs eat irregular-shaped holes in tender leaf tissue and may consume the entire seedling. Older nymphs and adults can consume all of the leaf except the tougher veins. 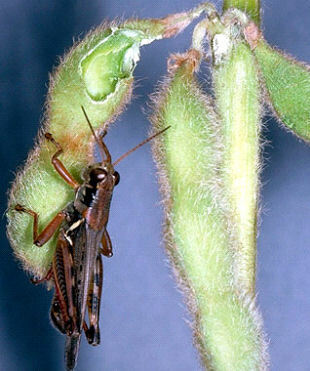 Grasshoppers chew through green soybean pods (which bean leaf beetles will not do) and destroy the seeds within. They also can feed on developing corn ears and destroy kernels. Reducing grasses and other weeds within and around fields will discourage adults from feeding and mating in that area. The economic thresholds are based on leaf area consumed or percent defoliation. In soybeans, a foliar insecticide treatment may be justified if defoliation exceeds 40% before R1 (full bloom) or 20% after R1. Consider an insecticide application in corn if grasshoppers are clipping silks or ear tips, or are removing foliage above the ear leaf. Border treatments are recommended if infestations are restricted to field edges.